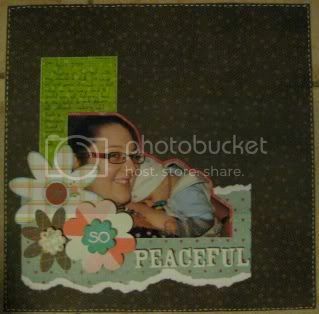 At long last i am FINALLY back to scrapping!!! We are in our own home now - a lovely big 4 bedroom house in Springfield - about halfway between Brisbane and Ipswich. So this means that i have my scrap room back all to myself. Even better than Cringila - i don't have to share it with our spare room, though i've had to share it with visitors of late (on a blow-up mattress). I've used some of the Fancy Pants "Sprout" range on this one. 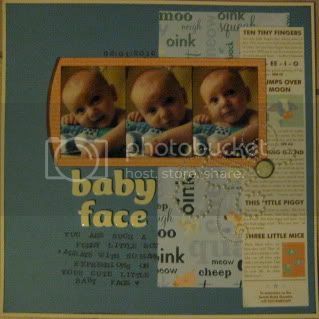 I've made this page from a Scrapbooking From Scratch blind challenge. Such a cute page of Calvin with a golf stick that my dad had a photo taken with at the same age. I've really got to find that photo!! 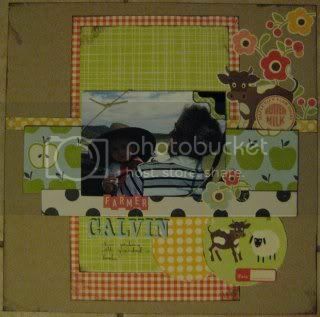 Another page from a blind crop, using October Afternoon "On the Farm" mostly. Cute photo of Calvin with Jeremy's dad and Jeremy's dad's hat on his head!! THis day we were out picking olives around Broke. Such a cutie!! 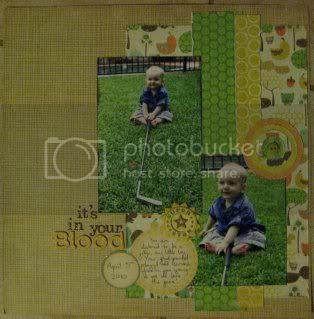 This page i made for a ScrapBoutique challenge last month. What a cutie, all snuggled up to me this day - i'd got him out of the car and carried him in and he was still fast asleep on me :) I've used some Bo Bunny for this one.